Two down, one more to go for Nik Lewis. The veteran receiver began the season fourth on the CFL's all-time reception list behind Hall of Famers Terry Vaughn (1,006), Ben Cahoon (1,017) and Geroy Simon (1,029). On Saturday, Lewis had six catches for 42 yards in the Montreal Alouettes' 38-6 road loss to the Toronto Argonauts, boosting his career total to 1,020. Should Lewis register another 1,000-yard season _ he has 43 catches for 403 yards and a TD _ it would be the 11th of his career, tying him with Vaughn for the most in CFL history. And that would be yet an impressive feat for a player who was a walk-on at Division II Southern Arkansas. "It's a great accomplishment to pass Ben,'' Lewis said. "All of those things are good when your career is over and in the off-season you can think about it. It's certainly been a challenging year for Montreal (3-5). 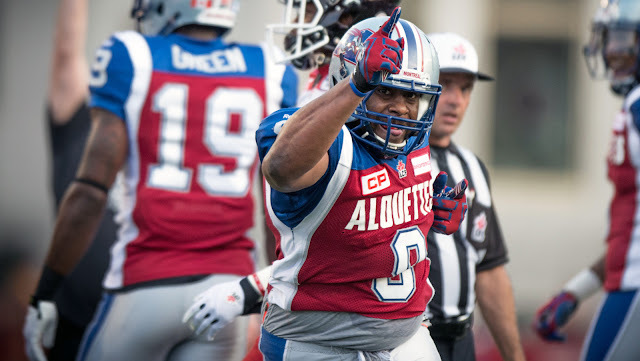 The Alouettes had a chance Saturday to win the season series with Toronto, but fell to 0-4 on the road and are just one point ahead of third-place Ottawa (2-6-1) in the East Division. Montreal plays its next two games at home, Thursday versus Winnipeg (6-2) and Aug. 31 versus Ottawa. That means five of its final eight games will be on the road, another big challenge for a franchise looking to avoid missing the playoffs for a third straight year. Winnipeg should present stiff opposition for Montreal. On Thursday, the Bombers beat previously unbeaten Edmonton 33-26 as quarterback Matt Nichols threw for 356 yards and two TDs while running back Andrew Harris ran for 105 yards and had eight catches for 120 yards. On Saturday, Montreal mustered just nine first downs and 138 net yards. Quarterback Darian Durant finished 14-of-27 passing for 93 yards with an interception. Montreal avoided being shut out for the first time since 1997 when defensive lineman Domonique Tovell returned an interception 61 yards for a touchdown. Boris Bede was busy, punting nine times. "The culture of winning isn't an easy thing to maintain,'' Lewis said. "Talent doesn't always win games, it's being able to play smart football throughout. Montreal head coach Jacques Chapdelaine said his club would be well served to follow Lewis's lead. "He's competitive,'' Chapdelaine said. "He's certainly an example we need to follow. MESSAM INJURY: The Toronto Argonauts shouldn't expect to catch a break Saturday when they visit the Calgary Stampeders. Calgary running back Jerome Messam, the CFL's rushing leader (559 yards, 4.99-yard average), suffered a knee injury in the Stampeders' 21-17 road win over the B.C. Lions on Friday night. Messam ran for 69 yards and a TD on 15 carries before being hurt. But the burly six-foot-three, 255-pound Messam is expected to suit up against Toronto, good news for Calgary with starter Bo Levi Mitchell nursing a reported upper-body injury. Mitchell, the CFL's outstanding player last year, was 15-of-31 passing for 237 yards versus B.C. Messam ran for 76 yards and a TD on 10 carries in Calgary's 41-24 road win over Toronto on Aug. 3 and added two catches for 14 yards. The health of Mitchell and Messam is key for Calgary (6-1-1), which will play four times within the West Division after facing Toronto. That will included include back-to-back games with Edmonton (7-1) then contests versus B.C. (5-4) and Saskatchewan (3-4). Calgary head coach Dave Dickenson expects defensive Charleston Hughes to play against Toronto (4-5). THIS 'N THAT: Toronto receiver S.J. Green, obtained this off-season from Montreal, has three 100-yard games this season, the lastest coming Saturday (nine catches for 145 yards, two TDs) . . . There were no inter-divisional games last week so West Division teams will carry an 11-game win streak against their East Division rivals. Ironically, the CFL's top two quarterbacks (Ottawa's Trevor Harris, Toronto's Ricky Ray) and its three leading receivers (Ottawa's Greg Ellingson and Brad Sinopoli and Green) play for East squads . . . The West holds a commanding 17-2-1 record against East teams . . . Good indications why the Ticats are winless. They're last in offensive points scored (15.8 per game), points allowed (35.9) and turnover ratio (minus-8). Zach Collaros has been sacked 20 times and pressured on a CFL-high 69 occasions. Ironcially, Edmonton (league-best 7-1 record) has been penalized a league-high 81 times. Nik should lay off the chicken. Nik, the Michelin Man, is over rated. Who cares? In my opinion you could do more WHL hockey on the cage I am as big a Rider fan as anyone but really hockey does go on and sometimes the Rider talk gets a bit draggy like you are looking for something especially in the off season. Just my thoughts I love listening to the cage but give us a mix.